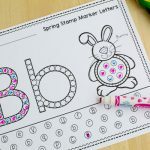 This simple caterpillar craft was inspired by one of everyone’s favorite children’s books – The Very Hungry Caterpillar. We love Eric Carle’s bright collage illustrations, the simple compelling text, and the fun holes punched in the pages of our board book. The book is more than just fun, though. 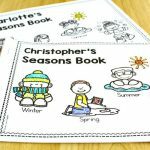 It helps children understand the life cycle of a butterfly, story sequencing, and one-to-one-correspondence of numbers to objects. That’s a lot for one little story! 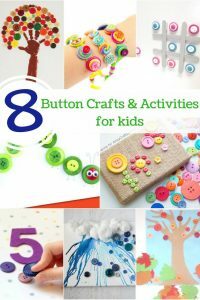 If your kids want to extend the story further, this button craft will also add fine motor skills to the list. The materials are pretty basic. I did have to buy buttons, but you may have some on hand. Buttons – I bought these (affiliate), plus a small package of red ones. You hardly need instructions for this simple craft. Think of these more as tips! 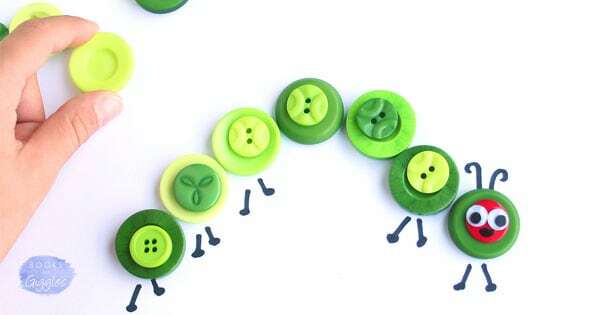 Lay out the larger buttons in the shape of a caterpillar. Glue them to the cardstock. Glue googly eyes to a red button for the head. Draw on a mouth if you want. Glue the smaller buttons on top of the larger ones. Draw on feet and antennae. Depending on the age and fine motor skills of your child, you can approach this in one of several ways. For preschoolers, place the bottom layer of buttons, and trace around them in pencil. Then pull them off and present the child with the paper template and those loose buttons. Once that layer is glued down, give the child the smaller buttons to glue on top. Glue on the googly eyes, and draw on the feet and antennae for the child. 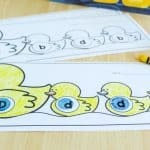 For kindergartners, show them how to plan their own caterpillar shape before they start gluing. Then have them glue on the bottom layer of buttons before you give them the smaller top layer buttons. Allow them to draw on their own feet and antennae. Have them help you glue on the googly eyes. 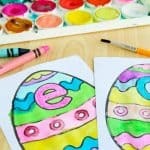 This post was part of the new monthly Kids Craft Challenge by a talented group of bloggers. You may like to check out all these other creative crafts and activities they’ve created using this month’s prompt – buttons! Wow, how adorable! Great fun for little hands. Thank you! Yes, there’s something irresistible about buttons! I love this cute little caterpillar! I’m going to look through our buttons to see if we have enough breen ones. Thanks! I think it could be cute with a variety of colors too.